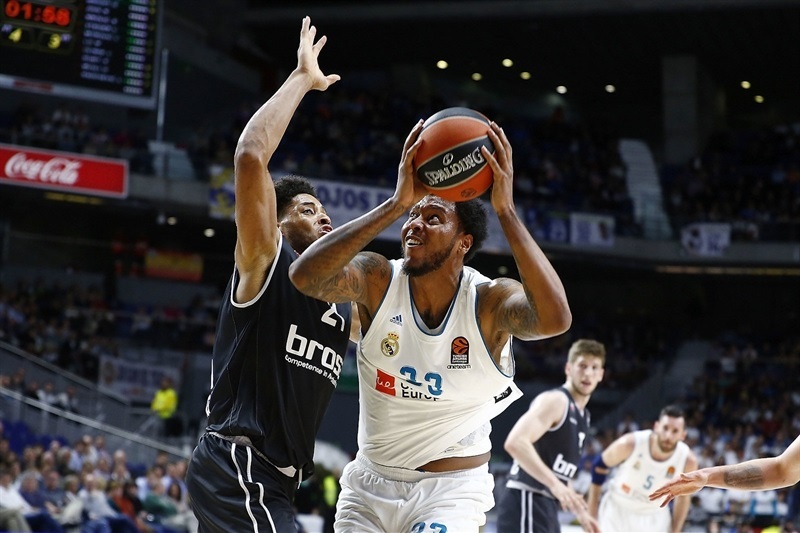 Real Madrid finished the Turkish Airlines EuroLeague Regular Season in style by downing Brose Bamberg 106-86 in the Spanish capital on Friday. 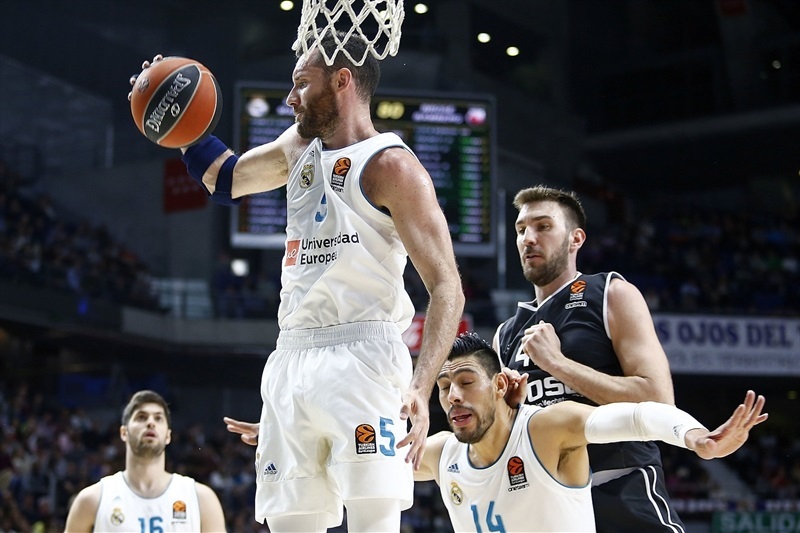 Madrid finished the regular season with a 19-11 record, fifth overall due to its tie-break disadvantage in a three-way tie with Olympiacos Piraeus, third, and Panathinaikos Superfoods Athens, fourth. 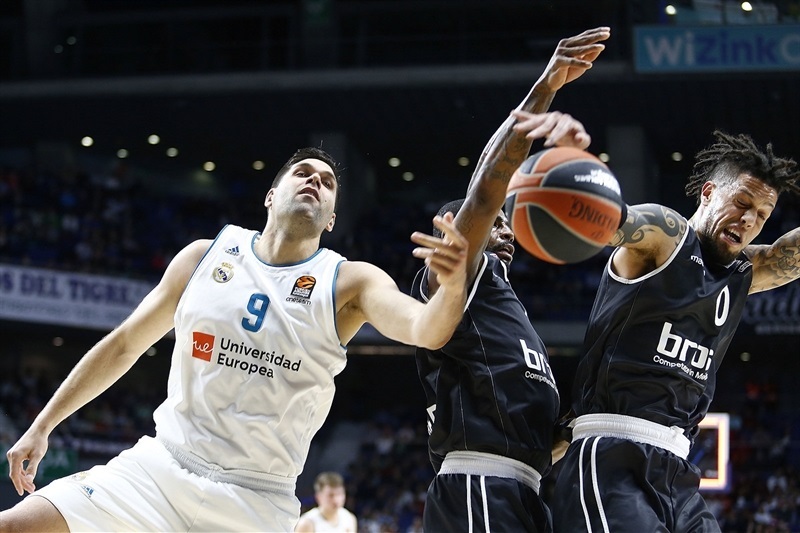 As such, Madrid will face Panathinaikos in a best-of-five playoffs series for which the Greek powerhouse will have the home-court advantage. Bamberg finished the regular season with an 11-19 record. 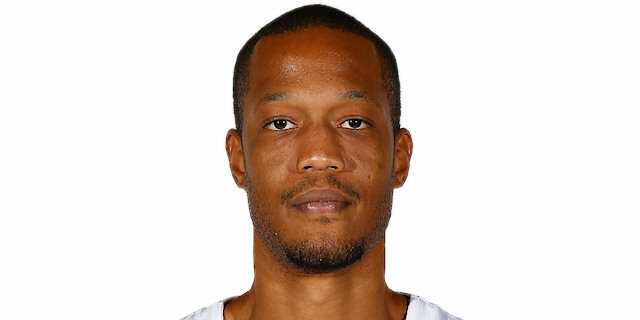 Anthony Randolph led the winners with 23 points on 4-of-4 three-point shooting, 5 rebounds, 4 assists and 5 steals. 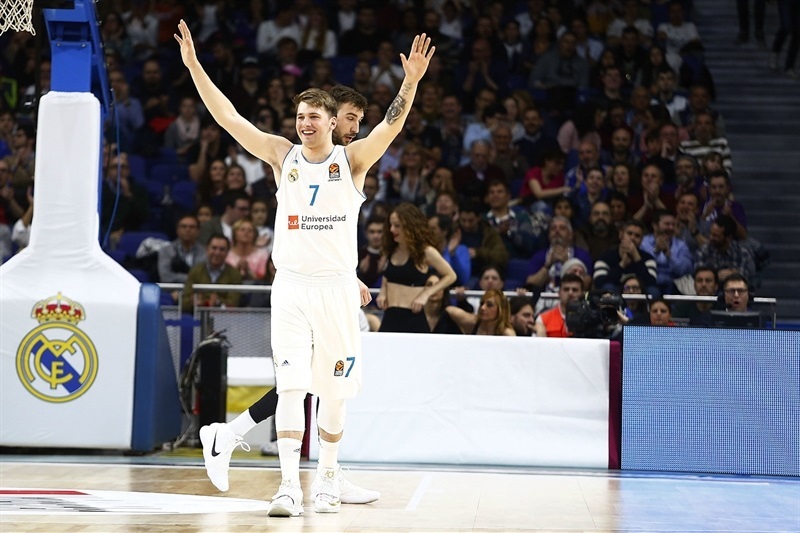 Jaycee Carroll added 19 points, Gustavo Ayon 14, Luka Doncic 12 and Rudy Fernandez 10 for Madrid. 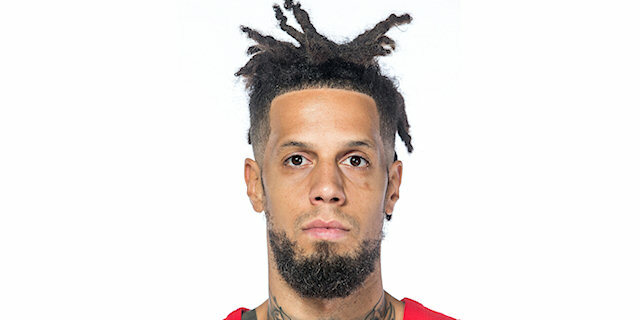 Daniel Hackett led Bamberg with 17 points. Dejan Musli added 16, Augustine Rubit 12 and Dorell Wright 11 for the guests. 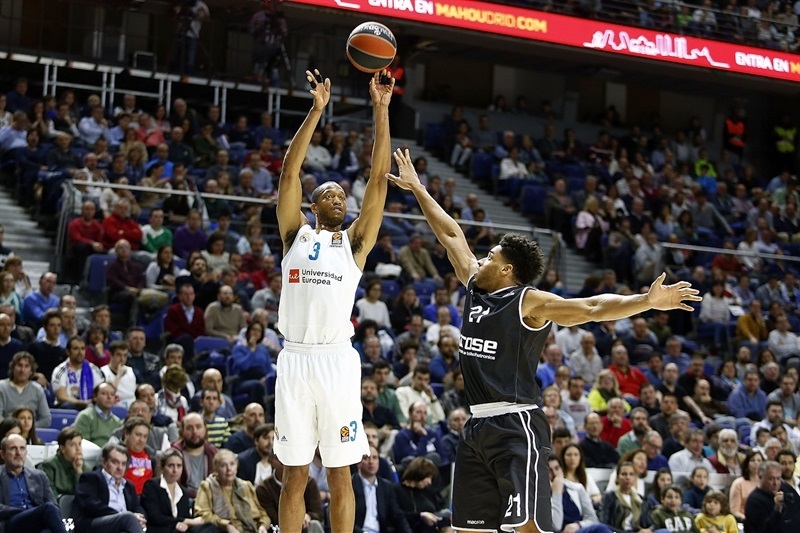 Bamberg led early by as much as 29-35, but by halftime Madrid was ahead 53-50. The hosts boosted their margin to 82-69 after 30 minutes and then again to 99-78 soon after that to seal the outcome. Randolph got Madrid going with a three-pointer and back-to-back dunks off steals, making Bamberg call timeout at 7-0. Luka Mitrovic struck from downtown, Maodo Lo hit a jumper and Musli hit a layup to bring the guests within 9-7. Randolph nailed a jumper and Fabien Causeur added a three-pointer but Wright and Musli kept Bamberg as close as 15-13. Doncic hit a jumper and Randolph added his second three-pointer but Rubit and Wright brought the guests even closer, 20-19. Wright downed a corner triple before a fastbreak layup by Hackett gave Bamberg its first lead, 25-26. Free throws by Doncic and a baseline jumper by Leon Radosevic fixed the score at 27-28 after 10 minutes. Back-to-back triple by Aleksej Nikolic and Hackett boosted the guests' lead to 29-35 early in the second quarter. 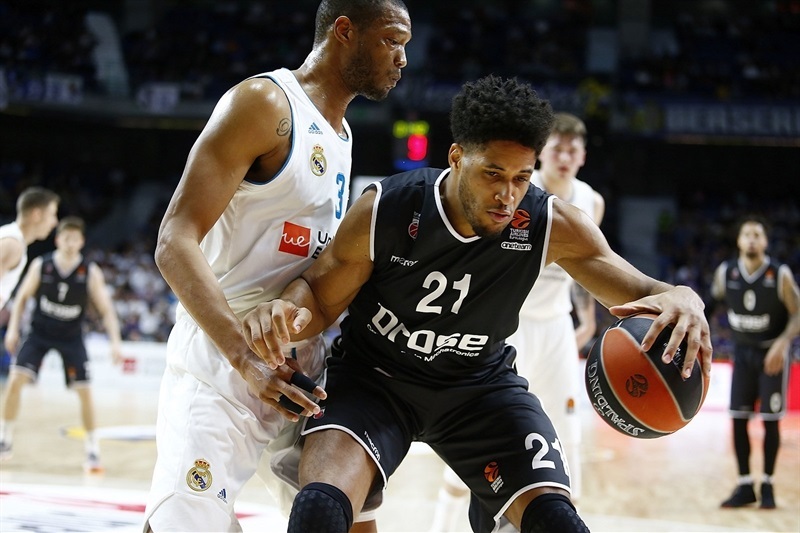 Trey Thompkins and Chasson Randle fueled a 6-0 Madrid run but a red-hot Hackett restored a 35-39 Bamberg lead. Fernandez nailed consecutive three-pointers and Carroll added a floater but an unstoppable Rubit singlehandedly kept the guests ahead, 43-45. 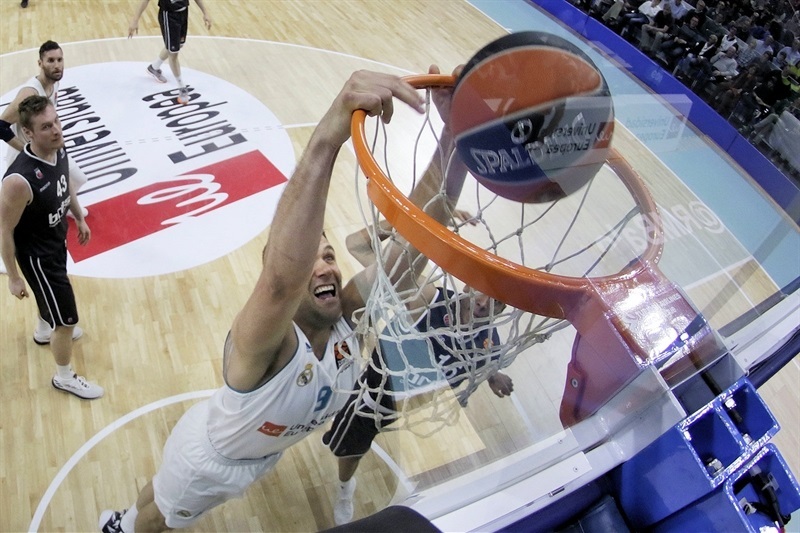 Felipe Reyes scored down low and Ayon erased Nikos Zisis's free throws with a layup for a 47-47 tie. 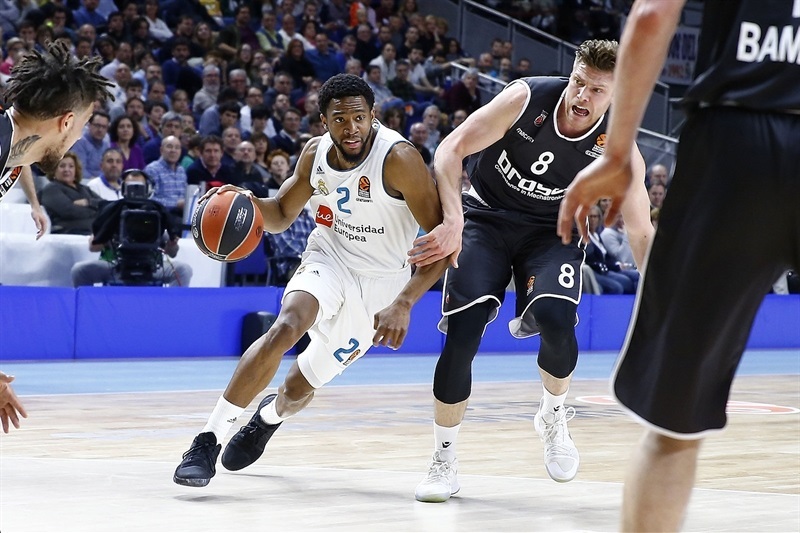 Lo struck from beyond the arc but so did Doncic and Carroll for a 53-50 Madrid lead at halftime. A floater by Wright and a jumper by Zisis gave Bamberg its last lead, 53-54, after the break. 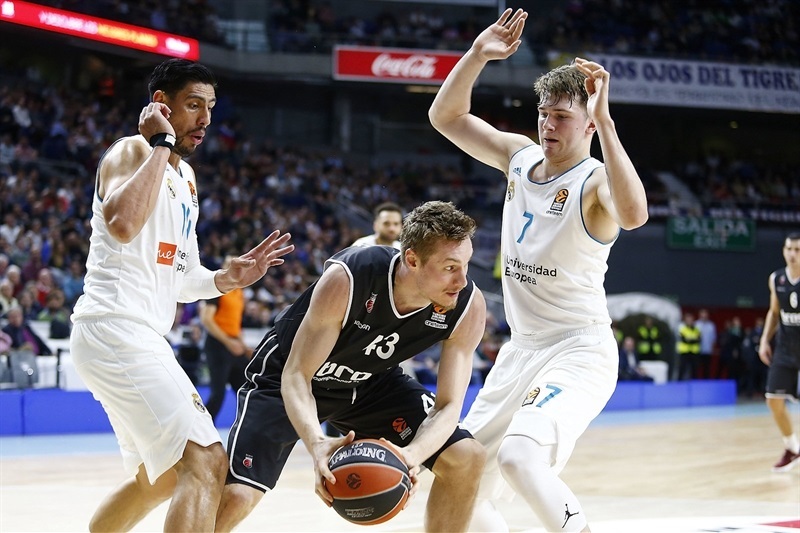 Ayon and Doncic combined for 7 points in an 8-0 run that put Madrid ahead for good, 61-54. Musli took over with a wild put-back slam but Randolph answered from downtown and a layup by Doncic made it a double-digit game, 68-58. An unstoppable Ayon scored 3 inside baskets leading to a three-pointer by Randolph that broke the game open, 78-63. Radosevic and Hackett brought Bamberg a bit closer, 82-69, after 30 minutes. Randle took over with a reverse layup and Reyes dunked but Hackett kept Bamberg within 86-73. Louis Olinde followed a jumper with a triple but Carroll answered at the other end for a 92-78 score with 6 minutes left. 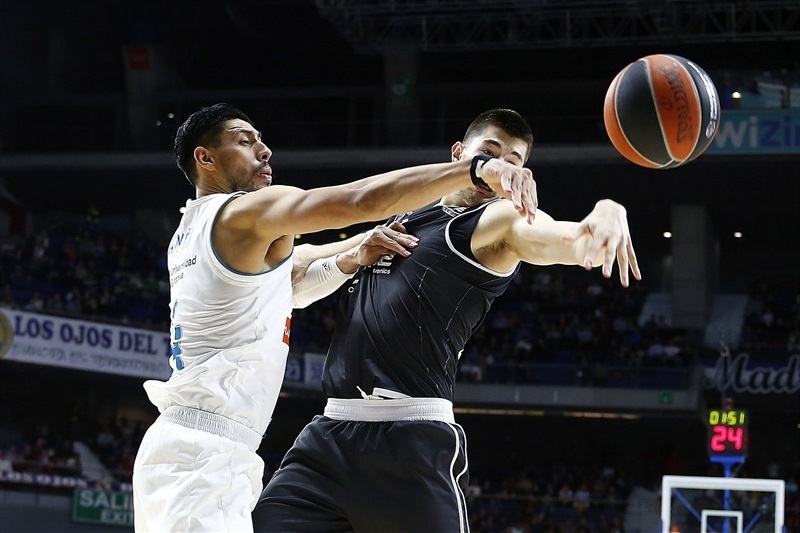 Carroll kept pacing Madrid and an acrobatic driving layup by Fernandez sealed the outcome, 99-78, as Los Blancos cruised to a well-deserved win. "I think the game was a little bit up and down. We changed our defense in the second half and were a little bit more aggressive. We got some steals, could run and continued playing good offense, so in the end we got a good victory with a big margin in the end. We knew it was going to be difficult because it was kind of a special game with nothing to play for them and for us. Happy for the victory – in the end it is a EuroLeague victory – and happy for the effort of the guys tonight. Right now, I didn't even think about the playoffs yet. We have time until the playoffs and the first thing I am worried right now is recovering my players. 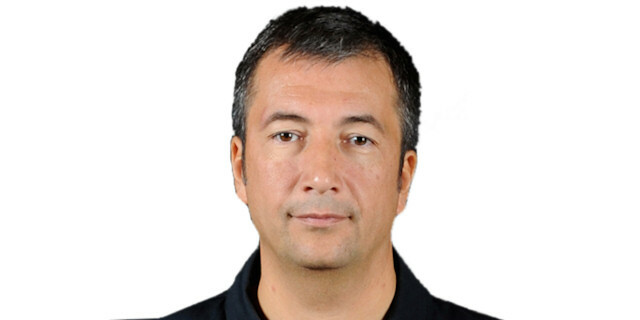 I have some injured players ready to come back – Campazzo, Tavares, Ayon just came back. We have to see the Sergio (Llull) situation. Right now, if I have to say something, I would like to say that I would like to be healthy, more than anything else. We know we play against a great team without the home-court advantage, but for right now, the only thing I am worried about is Real Madrid being healthy." "Sergi is a lot better and we have to see, little by little, how he goes into the team, although we know it is a big challenge." "First of all, I have to congratulate Real Madrid because they played very well in an important game. I am quite happy about the way we approached the game - of course, not the first couple of minutes, when we struggled a little bit and had three of the four turnovers that we had in the first half. Of course, this is part of our plan, trying to control the tempo, the rhythm. I have to work on our continuity because we proved that for most of the game, we were able to play at the same lebel of our opponents but too many times we struggled because of turnovers, bad shooting selection or unconsistent defensive positions, even rebounding, which is the pasrt in which we struggled more in the second half and it is the key for us to be at the level we expected. The EuroLeague is over for us and it is time to put our best focus in the German League and the next eight games, trying to find the way to go to the playoffs in the best position possible, and try to fight for the title. It sounds difficult but it is our big task." "I am getting there. Like I said, I have been trying to get there slowly. Tonight the shots went in and we did a great job defensively in the second half. It is going to be a tough game (against Panathinaikos in the playoffs). We will go there and play with our A-game in order to get the win." "We had some good moments of basketball. I think we fought until Madrid decided to push the accelerator. It is not easy – they are full of talent, with a deep roster. This was a good test for us to get ready for the Sunday game and to keep improving."